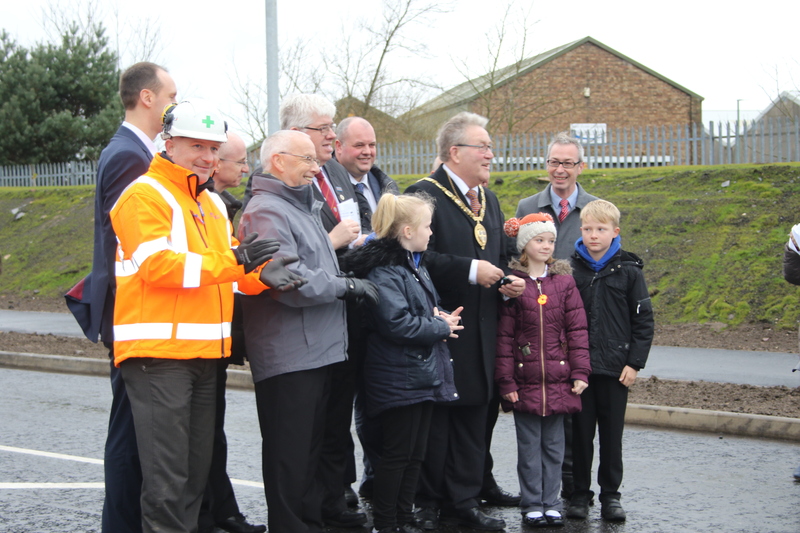 The New Road (replacing the famous Leadgate Bridge) was formally opened today by the leader of DCC, Councillor Bell who was ably assisted in the ribbon cutting by pupils from Leadgate Junior School. Mercifully the rain stayed away and after the official opening the first car to travel the road from Leadgate to Villa Real was driven by Neil Pears, the first bicycle to cross was ridden by Fr David Cleugh of St Ives Leadgate. After the ceremony we retired for refreshments to Leadgate Cricket Club where a fine spread was laid on for those who braved the weather to attend the opening. It seems a long time since direct access between Leadgate and Villa Real and onward to Consett was possible and one of the fringe benefits of the new road is that of a straight view from Front Street up to Villa Real.